Hole in the Wall Pub is difficult to find. It’s hidden in the back right corner of a strip mall. Seating inside includes some picnic type tables, bar stools & some full-on tables outside. I take a seat at the bar, nearest to the grill/cooking area and size up the menu. There was something I had been thinking but didn’t really want to confirm until I tried the food. First up were the Wings, I ordered them Hot (in flavor, not temperature). They were great crispy Wings with a slight char & tossed/marinated in a Hot Sauce/Worcestershire sauce mix. The Wings were very reminiscent of Sports Grill or Keg South, that puts them in great company. My fresh cut Fries were next. The long potato slivers were awesome and perfect for dipping in the red stuff. I watched as my Burger cooked on the grill and thought this guy is overcooking it. When it was served, one bite and I realized I was wrong. It had all the pinky goodness & juiciness I’d hoped for and more. 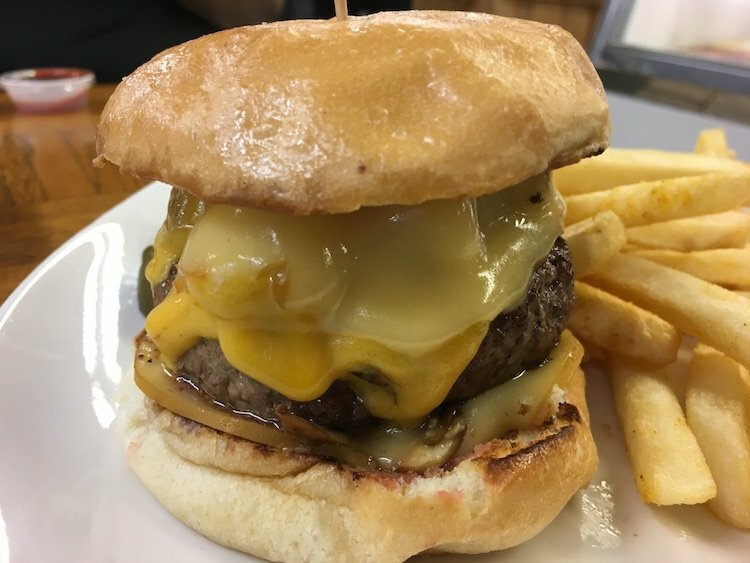 The toasted Bun and the melted American Cheese rounded out my great Pub Burger. This now brings me to what I was thinking: Hole in the Wall Pub is great BUT as a long time Keg South fan you can’t shake the similarities. I had been told it’s owned by a former Keg South manager which makes sense as everything including the decor seems familiar. The food is great and at the end of the day, isn’t that what it’s all about?